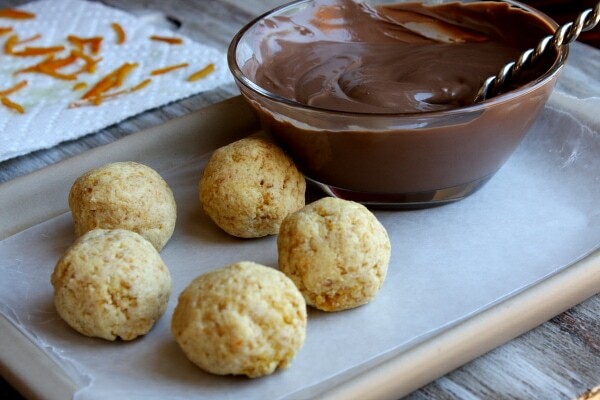 Use a fresh orange to make some Orange Cake Truffles! This recipe utilizes fresh orange juice… and zest too! Just bake up my simple orange cake recipe. And then pulverize it into crumbs in the food processor. 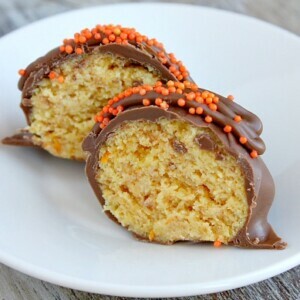 In true “cake ball” fashion, you then mix those crumbs with some cream cheese frosting… and even more of that orange zest!Scoop out some of the crumbs-mixed-with-frosting. I like to use my handy dandy cookie dough spring scoop. This is truly one of my favorite kitchen tools And it ensures that all of your cake truffles will be the same size. In fact, roll all of them into balls. Then pop them in the freezer for about 15 minutes just to firm them up a little bit. At this point, you can decide what you’re going to dip them in (I used Wilton’s Candy Melts), and what you’re going to sprinkle on top to make them pretty. Dip them one by one in the melted chocolate and then set them on waxed paper to dry and set. Top each truffle with a little something before the chocolate sets. I like to top truffles with a little “hint” of what’s inside. Here I used some thinly sliced orange zest that I candied in a frying pan with a tiny bit of water and sugar. 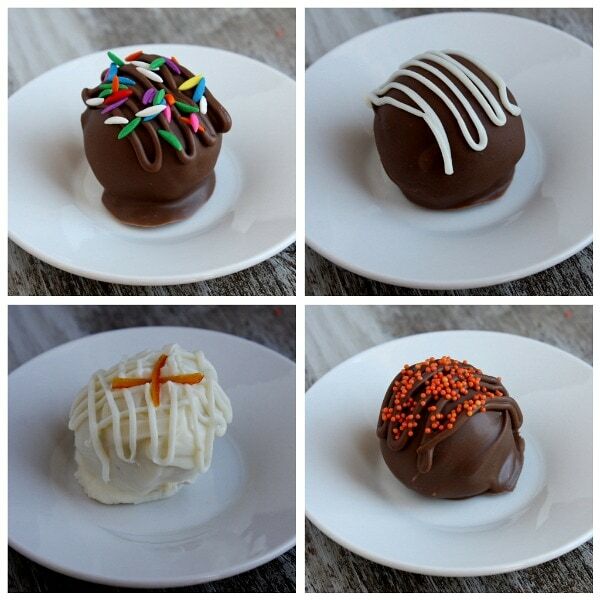 And here are a few more… some I drizzled additional chocolate on top, and then added the decor. They were kinda sorta a big hit around my place with both the adults and the kids. I keep them in the refrigerator so they are a nice, ice-cold treat on hot days! 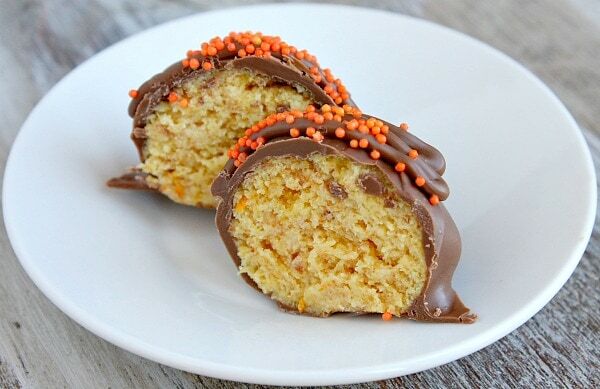 Yep, these are those cake balls... an orange-flavored sort... covered in chocolate! Prepare cake: Spray 9x13-inch pan with nonstick spray. Preheat oven to 325 degrees F. In a large bowl, whisk together cake mix and pudding mix. Add orange juice, oil, eggs, orange zest and vanilla. Use an electric mixer to beat on low speed until well blended, scraping sides as needed. Pour batter into the prepared pan. Bake 35 to 40 minutes, just until cake is set and toothpick inserted in the middle comes out clean. 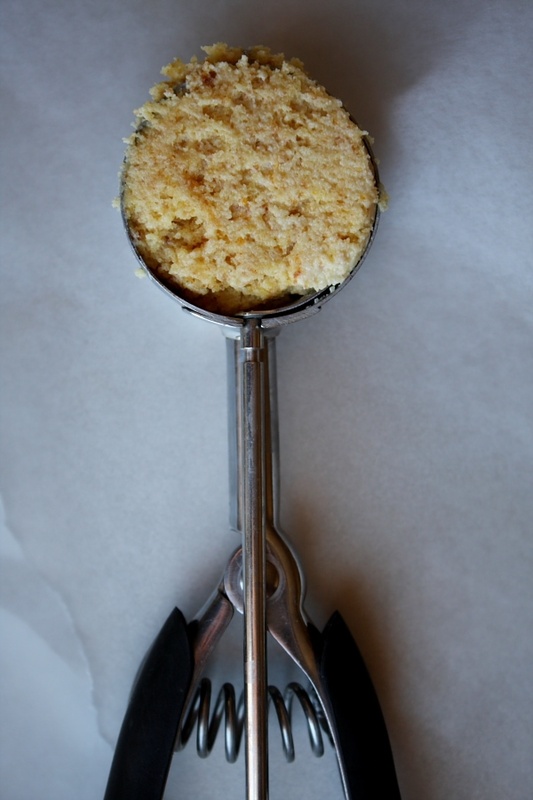 Let cake cool completely, then scoop chunks of the cake into a food processor; process into crumbs. Prepare the cake balls: Place cake crumbs in a large bowl. Add 3/4 of a tub of frosting + 1 Tablespoon orange zest. Stir with a sturdy spoon until ingredients are well combined. 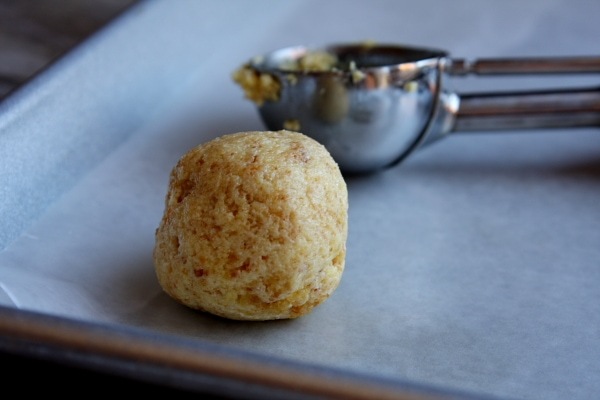 Shape frosting/crumb mixture into 1-inch balls and place them on a waxed paper-lined cookie sheet. Place the cookie sheet in the freezer or refrigerator just until the cake balls have had a chance to get a little bit firm. 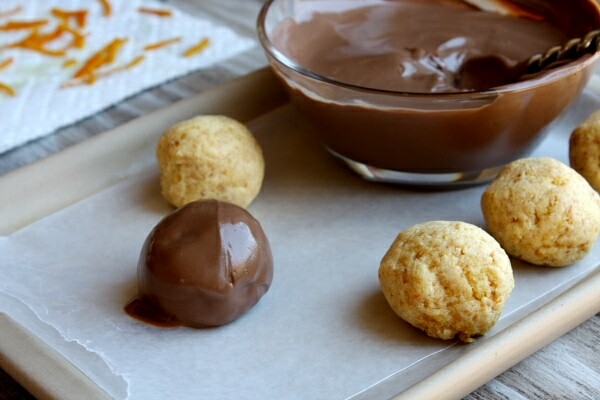 Dip the truffles: Melt about a cup of candy melts in a microwave safe bowl (about 2 minutes on high). Stir until smooth. Use a small spoon to lower a cake ball into the melted chocolate and swirl it around until completely covered with the chocolate. Scrape the spoon against the side of the bowl and carefully remove the cake ball from the chocolate and set it on waxed paper. Immediately top with decor and let sit to dry. 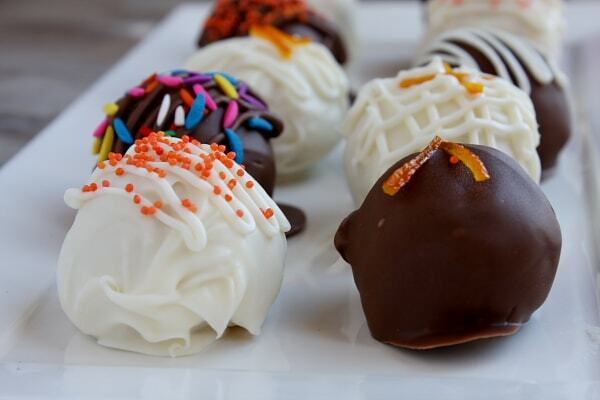 Continue with remaining cake balls and chocolate. Assembled truffles can be kept at room temperature or in the refrigerator until ready to serve. When you bake your cake, you may end up with the top of the cake as a brown layer. If you don't want that brown layer to be mixed into your crumb mixture, just use a sharp knife or a spatula to gently scrape off the brown top layer of the cake. 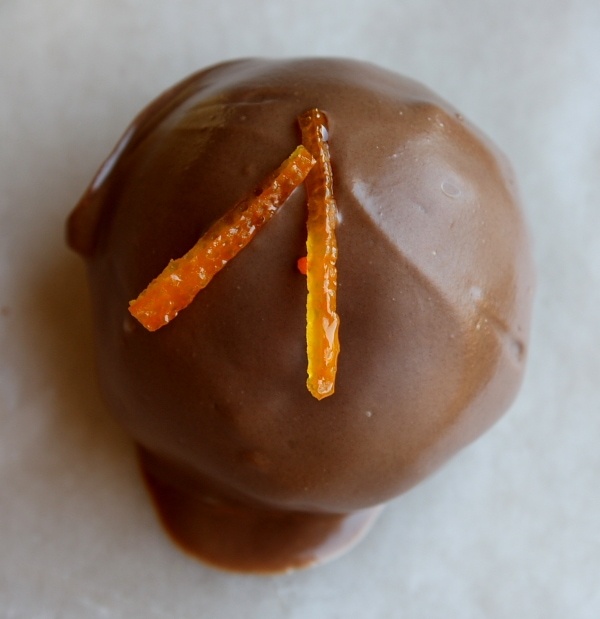 If you'd like the center of your truffles to be more "orange" than shown in the photos, add a drop or two of orange food coloring to the mix (or red/yellow).